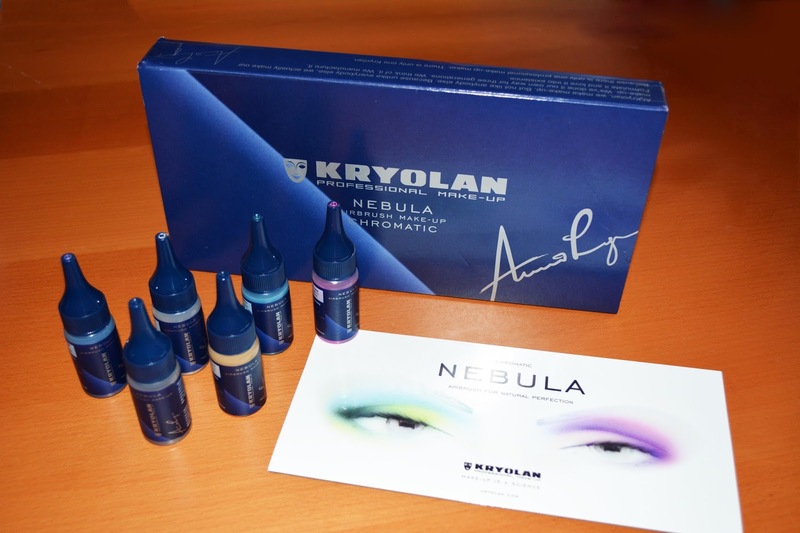 The Airbrush Makeup Guru: Nebula by Kryolan: First Impression Review of the new Airbrush Makeup line! Nebula by Kryolan: First Impression Review of the new Airbrush Makeup line! Introducing Nebula by Kryolan: 54 shades for a natural yet super resistant makeup. Kryolan is a legendary professional makeup brand. Since its beginning in Berlin, Germany in 1945, this company has been proudly run by its original founding family, and many of its products have become standards in the theatrical, fashion and film industry. Airbrush makeup could not be missing from an extensive catalogue such as Kryolan's, and for several years the brand has been distributing three acclaimed product lines: Micro Foundation On Air (silicone based) Air Stream (water based) and Aqua Proof (alcohol based for body painting). In the last year however Kryolan has taken a further step in the airbrush makeup direction with a sizeable investment in the creation and the promotion of Nebula, a new line of innovative colors with a high pay off that was conceived primarily for beauty application. We couldn't wait to try these products and we are now ready to share our first impressions. Please come back to these pages next week for a full review and video tutorial of Kryolan's airbrush kit and Nebula line. 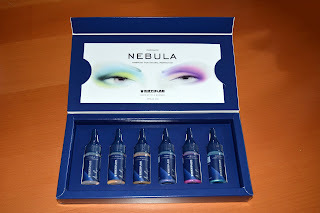 Nebula is a silicone based line that features 54 colors divided in 6 shade groups: Complexion 1 and 2 for foundation, Eyebrow, Irridescent 1 and 2 for eyeshadow and blush, Chromatic for opalescent eyeshadow and finally Vivid, which includes six primary colors for any other use. 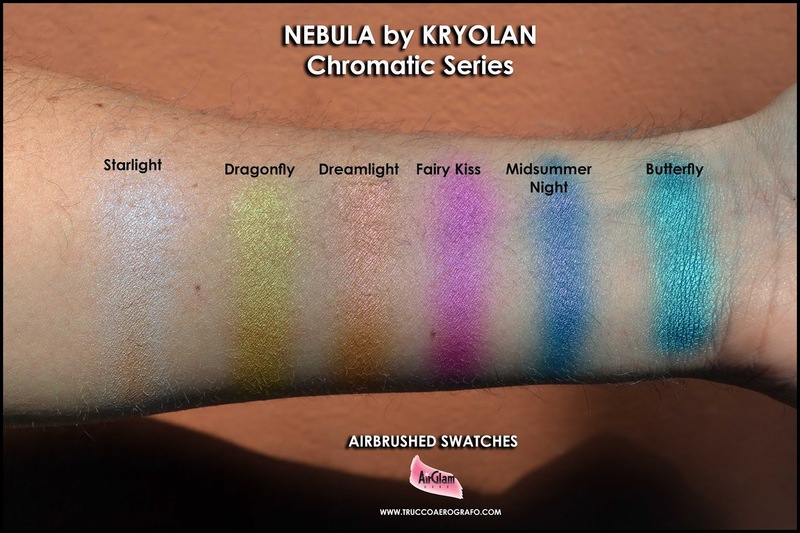 Just like any other product in the Kryolan brand, Nebula has its own individual color chart, and its shades are not matching any other product directly. Nonetheless, the line itself is quite extensive, and offers endless mixing possibilities. The colors are sold in kits of 6 shades for each group, however you can also purchase them individually and build your kit more gradually. The packaging of the products is one of the most attractive and luxurious I have seen for any airbrush makeup products. The color kits are presented in very elegant blue boxes with a magnetic lid, and featuring a slick brochure inside with tips on airbrush maintenance. The dispenser on the bottles opens with a half a turn anti clockwise, and the caps are relatively easy to keep clean. Any spill can be wiped quickly with alcohol 99, which won't affect the high quality printed labels. The product's formula is silicone and acrylates based. That said, the makeup viscosity is very low, so much so that it can be used with the same low pressure you would apply to a water based product (5 PSI). With the launch of the Nebula range Kryolan has made a special airbrush available with a 0,4 mm nozzle, so that the shimmer pigments could be dispensed without difficulty, however you will be able to use this product even with smaller nozzles, as we did for the swatches below that were applied with a .25 airbrush. We can't wait to demonstrate a full beauty look made entirely with Nebula, which undoubtedly represents an interesting new option on the market. Application: Apply the color in light passes, waiting a few seconds for each pass to dry. Lightness is a fundamental rule here as with most airbrushable products, especially when you are applying to delicate areas such as the eyelid, where you must avoid excessive layering that would result in shorter durability or cracking. Cleaning: You will not need to clean the airbrush when you change colors, simply discharge the previous color and test the following on a piece of paper to avoid mixed color output. At the end of the job you will have to use a silicone based cleaner or alcohol 99% followed by distilled water. Kryolan has created a very effective, alcohol based cleaner called Nebula Remover. 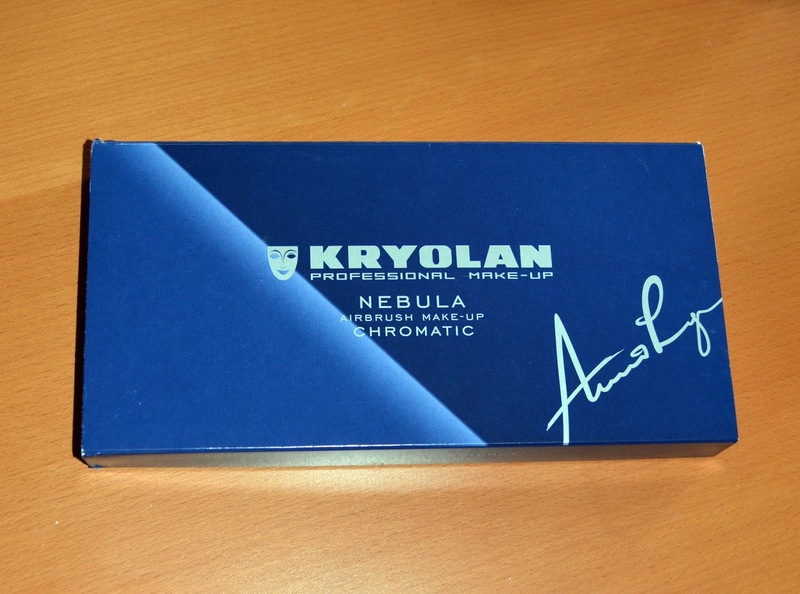 Availability: Nebula is available on Kryolan's website, through Kryolan's own stores or its many distributors.